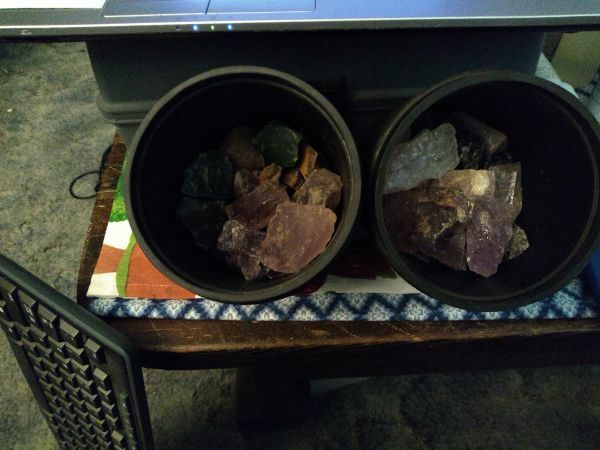 In one barrel I have smokey and rose quartz with a few pieces of amethyst, the other has bloodstone, carnelian, couple pieces tiger eye and a few pieces amethyst. I think this a reasonable combo but I'm reading that the amethyst bruises and should be tumbled alone. And I'm reading so many different opinions on how full to load these barrels. See pics, add more? There's a really good mix of sizes, the big stuff just sitting on top. Have a 40# bag of pea gravel and a small amount of ceramic media. Looks like I'm hitting up the bag of gravel. If they are all the same hardness or within 1.0 on the Mohs scale, don't feel bad about running them together. I'm looking at your photos, and rock level looks really, really low in the barrels. A barrel should be filled to 2/3 or 3/4. Coarse grind should not be cushioned. It's the subsequent stages where amethyst might bruise. That's where plastic pellets or other filler might come into play. 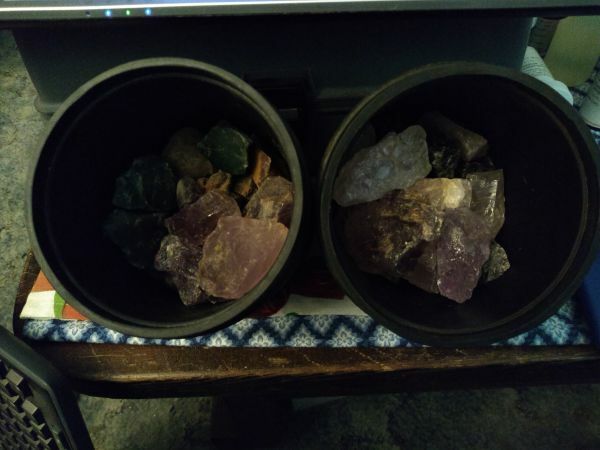 I've rotary tumbled quartz and amethyst which are both prone to fractures down the road. Let the coarse stage roll. I happened to use plastic pellets for all stages after coarse. Here's a photo from some amethyst when I got back into the hobby. No additional fractures were caused by the tumbling process. The pics are a bit deceiving, they are just under 2/3 full. So I can run coarse without cushion? That would be cool! Under 2/3 for amethyst is too low, depending. I go at least 3/4 full. Add polished pea gravel to coarse and medium. Sometimes pre polished ceramic tumbling media. Then plastic pellets for remaining 3 stages. Some Amethyst is so prone to fractures. I would clean completely between stages. Check under magnification after the 1200 AO pre polish run and cleaning after that. 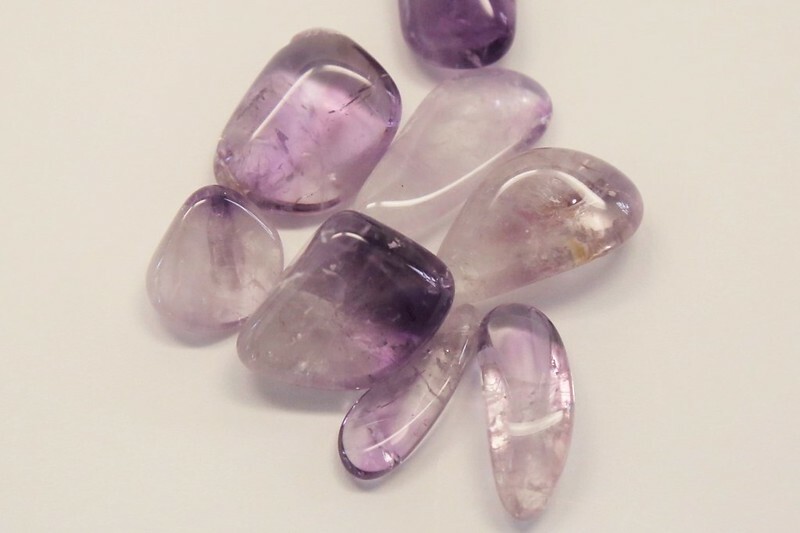 If the Amethyst has fractured some and there is grit in the cracks, then more cleaning. aDave is more experienced than me, but I have been trying to get a great polish on amethyst. It has been hit and miss. Run 3/4 full, that includes the small gravel or pellets.... Add your grit, than run water 3/4 full from the rock (Not the barrel)..
One small suggestion- keep records of what you are doing, before you know it you will have a lot of reference material you can look back on that will help you continually achieve better results. Material run, grits used, durations, media used, water level, slurry thickeners, progress notes, etc. Yes. I take photos of everything after each stage and prior to starting. Then make notes on what was added to the barrel for the next stage. Even make a note when I check something after 7 days and let it run longer, and why. If I used the 1 lb or 3 lb barrel. 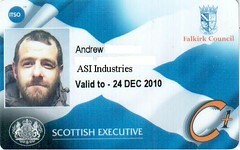 This info has helped a lot, especially the photos. That's a good suggestion, and it works well for some folks, especially with batches of one type of rock. For me, it didn't work so well as I always ran mixed batches of rocks that were relatively close in hardness. As such, as soon as I dialed in my routine/recipes, everything was run exactly the same in terms of grit and stage durations. The only thing I ever kept track of is the date a particular stage was started. In this case, all I did was place a piece of masking tape in front of the tumbler(s) with the date written on it. ETA: Just reread what I wrote. For clarification, it's not so much the logging of info didn't work for me, I didn't have a need for keeping track of the details. Similar mixed batches made it easy to do the same thing every single time, without varying anything. It would have been a different story if I was experimenting with individual batches of a certain type of rock. I have a white board with all the info on it. A column for each barrel, 3a, 3b, 12a, 12b, 6, and mini vibe. All the info for each barrel continues as long as it's tumbling. I have been tumbling two 6 pound barrels for a coupla years now. Never wrote anything down, and only once, did I ever lose track of what was going on in each barrel. Wasn't a big deal at the time, one barrel was Stage 3, other barrel was AO-1000 prepolish. Couldn't remember which was which ? Never was a take notes guy either. I go with the whiteboard method also, just write down the day I started the stage. I have six barrels going (when tumbling rocks), I have to keep a journal... Hahahaha.. They keep me busy..
green quartz (Adventurine) can be tumbled with tiger's (gold) or Hawk's (blue) eye! 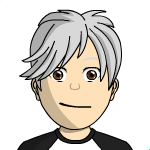 Last Edit: Apr 22, 2019 1:13:31 GMT -5 by As I in does tries!